Established in 2000 by Paul Devenny, the company covers a number of areas throughout the country, such as Brighton, Cumbria, Edinburgh, Glasgow, Kent, Lancashire, Liverpool, Leeds, London and Newcastle and has expanded its network of contracts across Great Britain and Ireland. The franchise model is focused on the provision of duct cleaning and commercial kitchen deep cleans, offering services that are tailored to customers’ specific needs. They work with specialist products and machinery to attain the highest possible hygiene levels, complying with the latest TR19 standards and issuing the necessary hygiene certificates required by their customers’ insurance companies. EnviroGroup offers three franchise packages, Standard, Gold and Platinum, which means that franchisees can choose the level of support and size of the territory that’s most suited to their own business objectives. Their franchise model is focused on ongoing support, compliance, operational guidance, training and marketing and, in order to give franchisees the best possible start, they design a launch programme for each franchise that aims to create maximum, local impact and awareness. EnviroGroup is currently looking to recruit new franchisees across the UK, particularly in the North West, Scotland, North East, South West, London and the Midlands, to respond to contracts already identified in those areas. The company is also accredited with Transmit Funding, meaning you could receive up to £25,000 in unsecured loans, should you need financial assistance in purchasing your franchise. If you’d like to earn £50,000+ net profit per year by running a professional, highly-accredited business within your own, exclusive territory, EnviroGroup would love to hear from you! 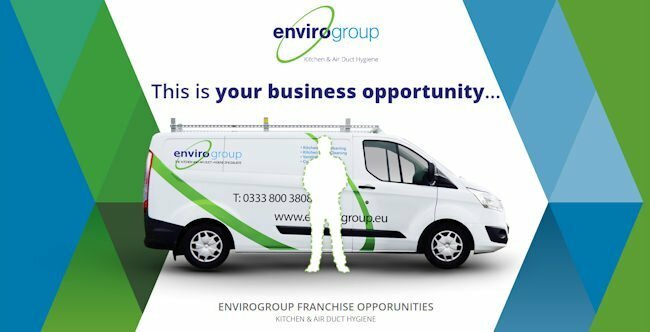 You can call John Brooks on 0161 766 8679, or visit their franchise website at www.envirogroupfranchising.com to find out more about this exciting franchise opportunity.